Dr. Hampton accepts her award from EEANM President Kathryn Venzor. 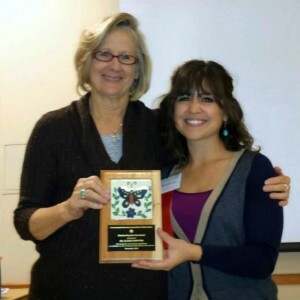 Elaine M. Hampton, Ph.D., was recognized for her long-term, sustained support and service to the field of environmental education with the 2014 Outstanding Service to Environmental Education Award. She was a part of EEANM from the beginning, serving as board president in the late nineties. She recently returned to serve as a board member and as secretary. Dr. Hampton has a long career as an educator and researcher with experiences on both sides of the U.S.-Mexican border: researching education in factory communities in Mexico; Associate Professor and Department Chair at University of Texas at El Paso; middle school science teacher in Las Cruces; environmental education coordinator for the waste management education program at NMSU; author; program evaluator; owner of STEM Education Associates; and a short stint teaching sixth graders in an abandoned school bus on the outskirts of Ciudad Juárez. She is on the boards for Southwest Environmental Center and Weaving for Justice–and is a hobby beekeeper.